Battle of the Bulge 1940’s Style. Thank you Holly for posting this clip on my Facebook page! And then there are those 1940s smiles and perfect lipstick, no contortion of facial features as if a leg is being sawn off without an anaesthetic… oh no these gals have class. 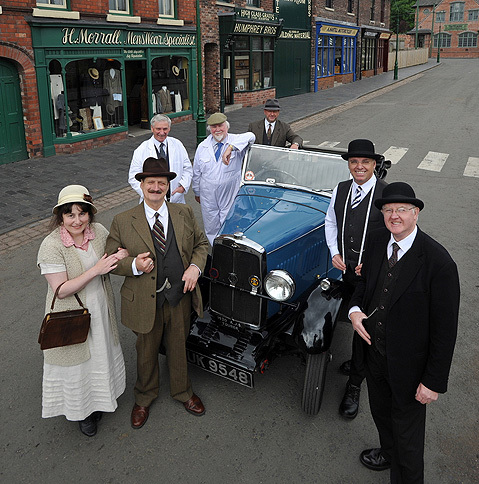 Black Country Living Museum Meet-Up? Thanks to Caterina, I’ve just found out about a 1940s Weekend at the Black Country Living Museum on July 19 and 20, 2014. I’ve ALWAYS wanted to visit the museum, it looks amazing so what better time to visit than during a day that happens to be 1940s themed! And on that note I wondered if anyone has any plans to attend this event and if so maybe it might be a great opportunity for some of us ladies to get together for a cuppa tea and a chat? Chew the 1940s cud and that sort of stuff…? Just thought I’d share my progress… most of the front is now done. 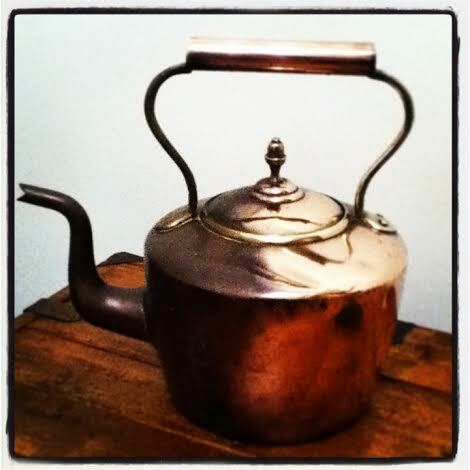 It’s a Victorian Acorn top Copper Kettle circa late 19th century and can’t wait to use it as a prop in some food photos. And yes, it was tasty and yes I would have eaten a second and third slice if I could have got away with it but as I was due to speak in front of a room full of women, it may have been impolite to stop mid speak to enjoy picking raisins out of my teeth. Anyway, the Wartime Raisin Cake was ‘Lovingly Handmade by Lorna’ and she has the recipe in her blog so please take a moment to pop over there for a taste! And thank you Lorna for being kind about my WI talk in your blog post too! I found this photo I had used on the blog about a a year or so ago when my weight was about 3.5 stone/50lbs less than it is now. 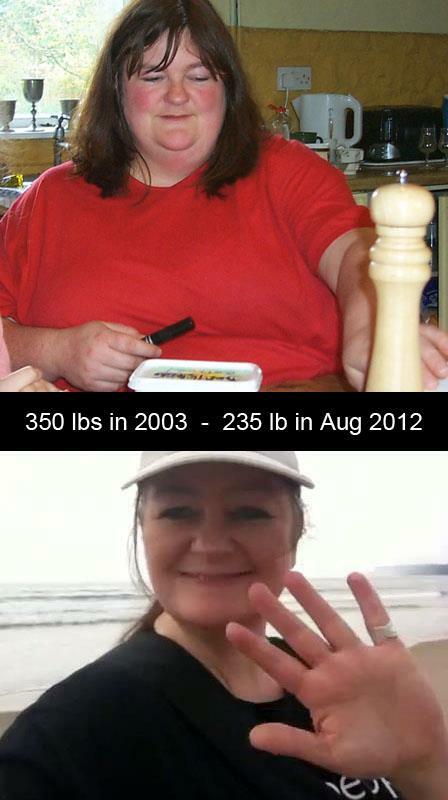 Currently I’m around the 20st 5lbs /285lbs mark… looking at the top image when I was about 25stone/350lbs I just cannot bear the thought of returning to that purgatory. So at the moment I’m trying to get psyched, to slip into that frame of mind that exhibits focus and determination and perseverance so the lbs will once again start to be cast aside and each step becomes lighter. I’ve got potatoes in the oven and plans to try a couple of new dishes out of old cookery books, and I’m sipping my first cuppa tea of the day (without milk). I once read that to keep away from the food cupboard, keeping ones hands busy is a good technique. 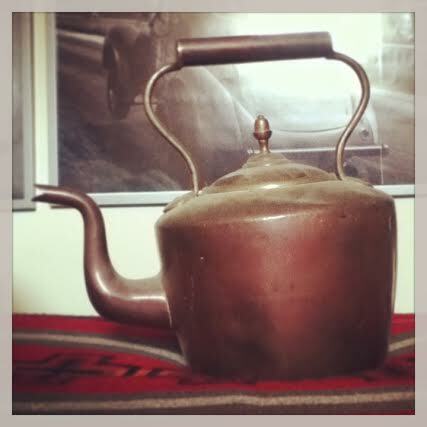 I’ve started polishing an old Victorian , acorn topped, copper kettle that Richard found in his attic (which belonged to his Mum)…. 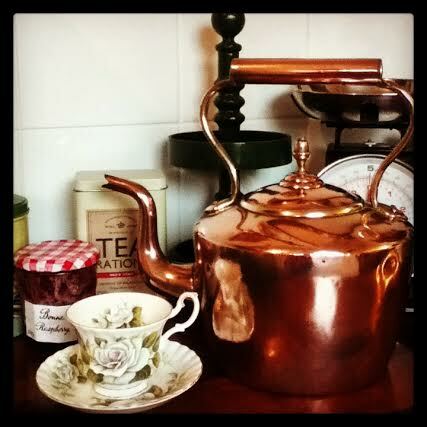 Everytime I feel the urge to raid the cupboards, I’m placing the copper kettle in front of me, reaching for the Brasso and cleaning a little patch at a time. The beautiful copper colour is emerging, it’s true colours hidden away under layers of life but with a little TLC, determination and perseverance (much like the qualities needed to conquer a weight problem) it’s brilliance will be restored..
One could learn a thing or two from this copper kettle. Brieana Kepley CONGRATULATIONS! Your name was picked at random from over 90 entries. 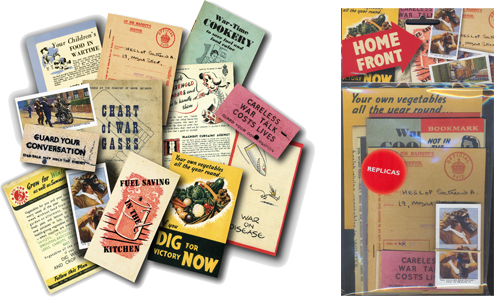 Wherever you are in the world please e-mail me ( 1940sexperiment@gmail.com ) your mailing address and I will pop the Home Front memory pack and replica newspaper in the post for you next week.